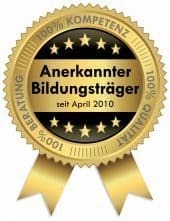 We’re a private massageschool in Offenbach near Frankfurt am Main, which only works with state-approved and tested therapists and wellness pros, with many years of experience in the business. As of March 2014 also in Tegernsee near Munich. Multi-day trainings as massage therapist, wellness therapist, wellness masseur, sports therapist and dietary adviser. One-day trainings in full body massage, sports massage, taping, Breuss massage, lymph drainage, Lomi Lomi, Hot Stone Massage, foot massage, herbal stamp, lava shells. Please note: Seminar language is German and for this reason as well as all course descriptions. In the massage practitioner massage seminar (certificate) you learn the basic techniques of the full-body massage for wellness, relaxation and prevention and the related know-how in two days. Location in Berlin, Offenbach near Frankfurt and in Tegernsee near Munich. The wellness massage training for sports- and wellness massager (5 certificates) includes the massage courses massage practitioner, hot stone massage and lymphatic drainage. This 4 day massage training provides your treatment options on a broader foundation. In this 6-day intensive wellness therapist massage course you will learn the complete knowledge of the courses massage practitioner, lymphatic drainage practitioner, and foot reflex zone massage. Additionally you will learn the hot stone massage and herbal stamp massage with garshan silk glove peeling. In this massage training, you will receive the profession basis for your entry and extension of your career opportunities in the wellness, relaxation and preventive area. In Offenbach near Frankfurt, in Tegernsee near Munich, Berlin and Bad Harzburg near Hannover. The massage therapist training includes a 6 day intensive training. Learn the most popular massage techniques in the field of prevention. Be capable of competently and professionally perfom these treatments. This massage training includes whole-body wellness massage, sports massage, sports taping, mobile massage and Triggerpoint. In Offenbach near Frankfurt, Tegernsee near Munich, Berlin and Bad Harzburg near Hannover. You have found your massage training or your several-day massage course? Book your wellness massage training comfortably and easily online under ‘Jetzt buchen’ and assure your course place. You come from far away? No problem! Look under hotels and guesthouses and find a cheap accommodation in our vicinity. Early bookers who paid are valid until four weeks before the course starts. Combinations discounts apply until 14 days prior the seminar. In both cases, the regular seminar price is due for late payment. All our massage seminars at our massage school take place in small groups of 4 to max. 8-12 participants. The courses wellness therapist and massage therapist are being offered with optional medical examination, i.e. you can take this test (inclusive), but you don’t have to. The prices of our massage courses are exempt from turnover tax after § 4 Nr. 21 UStG, since we are approved as an educational institution by the regional authority in Darmstadt. *Like all massage courses offered in Germany are also the above mentioned (wellness therapist, massage therapist, wellness massager) not to be equate with a certified massage therapist and lifeguard. The optional offered medical examination at the end of the massage training takes place within the institute and is used for quality assurance of our massage school massage training, but implies no state recognition of our massage courses.